Each year we have a “last in the lake” contest. The last in the lake gets to choose dinner at their restaurant of choice. Clare has won it the last two years in a row (the date was October 30th for the record) so we made the trek on Friday night to what’s becoming an annual tradition to the Mandarin restaurant. The Mandarin is the penultimate, king of buffets. Dave and I are skeptics when it comes to buffets—usually “buffet” means mediocre food at best served at room temperature. The Mandarin is the exception to the rule. They know how to do buffet right. We arrived and were greeted by our hostess who showed us to our seats in the F room. It’s important to remember your room number, because it is easy to get lost (Dave and I both entered the wrong rooms that night after filling up our plates). The Mandarin isn’t just a food experience. It’s eye candy if you like people watching. You never know who you will bump into or what you’ll see. Grace ran into a high school friend. I saw my co-worker Shelli and took the opportunity to ask her what she thought of their new practice of putting the number of calories on the glass above each dish. We both decided we didn’t like it. It’s particularly fun to see the different strategies for the buffet. Some prefer a traditional approach, starting with soup or salad, then hit the mains while others go off the board for 200 and mix it up. Some people get small dainty plates of like-minded dishes. Others pile food on their plate in a magnificent mound while you watch in admiration and fear as they wind their way back to their seat from the busy dining room. I especially like watching kids eat. Grace was a classic example. She started with the hot, traditional Chinese food fare, filled up on a plate of waffles and French fries for her second course, went back for salmon and ice cream and finished with a plate of ribs, green tea jello (which she didn’t eat), chocolate cake and a chocolate dipped strawberry. Nothing short of inspired. Mid-way through your dinner, as the blood rushes to your stomach to digest the copious quantities of food, your mind starts to wander. What’s the most anyone has eaten? I suggested to the waitress they should have a contest. Give contestants a two-hour window and have designated calorie counters track their every calorie. It would be an amazing marketing campaign for the restaurant. How much food do they go through in one day? The kids wanted to know what happens to the leftovers—do they get donated to shelters? When Clare started to slump over in her chair after her fourth plate of dessert, we asked our waitress if anyone has ever fallen asleep at the table before? The answer was yes. My only regret on Friday night was I didn’t have my phone to take any pictures, well and maybe that fourth plate of dessert. 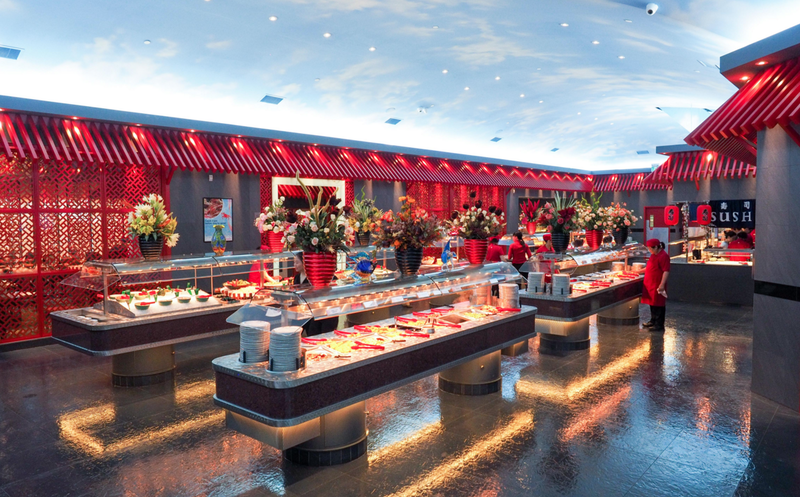 This week’s #HappyAct is to hit the buffet at the Mandarin. But give up on the calorie counting—it’s just not worth it!